Let me tell you a strange fact about me. I cook different dishes, come up with few of my own at times, and collect cookbooks, yet when it comes to daily cooking, I find myself stuck on making those same 5 or 6 dishes again, and again. I don’t know why it just happens. “Let’s break this routine.” I told myself. Oh! And why not start today? I went to the kitchen, opened the fridge, and scanned through it, nothing! I then opened the cabinet, and … voilà, Freekeh! What is freekeh you asked? It’s my hair clip! No seriously, it’s a grain. It’s made from green wheat that’s roasted, smoked, and lastly dried. The rubbing process of the grain gave it the name freekeh. Freekeh is an Arabic word and it means, “Rubbed.” Freekeh is low in fat, has four times more fiber than rice, more protein than most other grains, it aids in losing weight because of its short transition in the body, and is low in carbohydrates. So, it’s good for you. 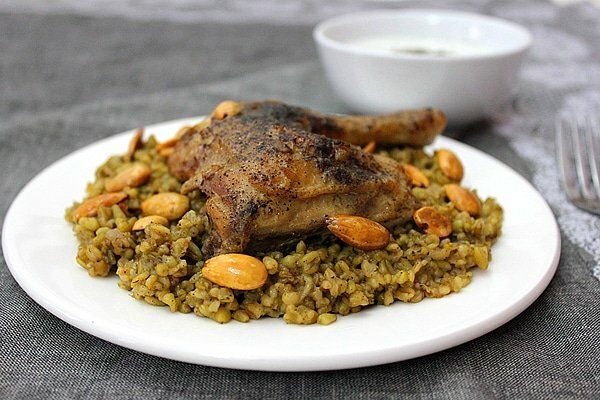 Freekeh with Chicken is an Arabic dish, but there are different versions of it, depending on which Arab country you are in. The recipe I’m sharing here is tweaked :). 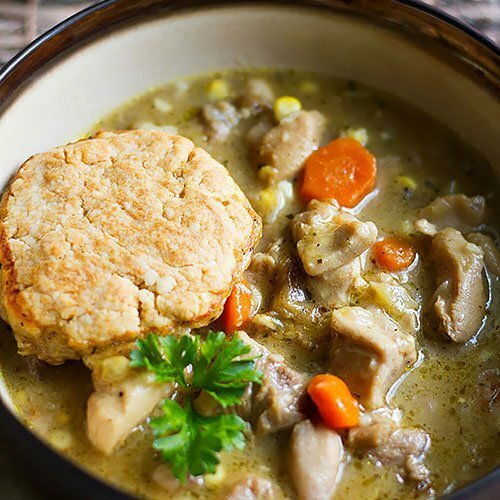 I find this way to be quicker, and (in my opinion) it gives better flavor to this dish. If you have never tasted freekeh, it’s time you do. Freekeh tastes good, even better than rice. You can get Freekeh at Melissa’s. 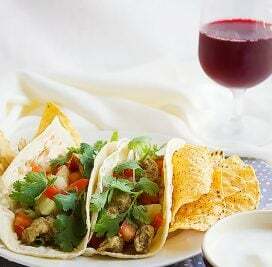 * You will use pinches of salt black pepper, cinnamon, and cardamom powder to sprinkle on the chicken. In a pan, add butter and oil. Fry onions, when translucent add the chicken, skin down. Sprinkle cinnamon, salt, black pepper, and cardamom on chicken. When the bottom side of the chicken turns light red, flip and season the other side. Transfer chicken to a baking pan. Pour 1/4 cup boiling water in the baking pan, cover and bake chicken on middle rack until cooked, around 40 minutes. Drain freekeh and add to onion, keep stirring on medium heat, until freekeh dries a bit. Add the freekeh spices and stir for 1 minute. Add 3 1/2 cup boiling water to freekeh and the chicken bouillon. When it boils, cover tightly and continue cooking on low heat for 45 – 50 minutes. Check on freekeh every 15 minutes so it won't dry out and burn, but don't mix with spoon. 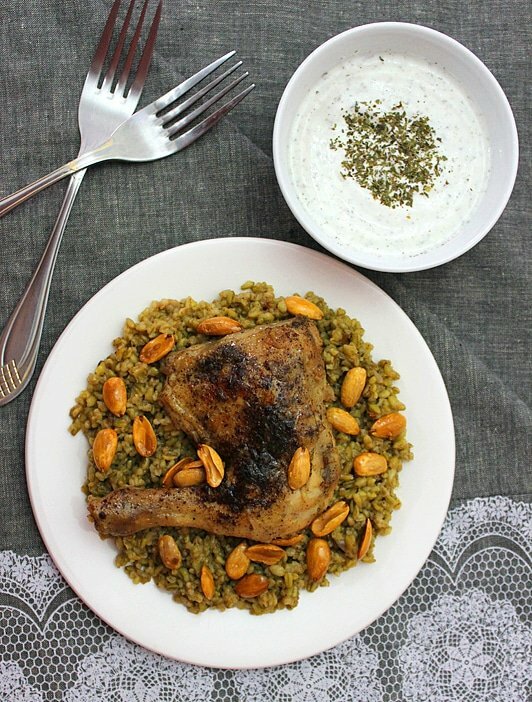 Dish the freekeh onto serving plate, place the chicken on top, and garnish with fried almonds. I have never heard of freekeh so I believed you when you said hair pin! Just kiddindg. 😀 Thanks for the introduction of this special grain. How interesting and I’d love to try this. 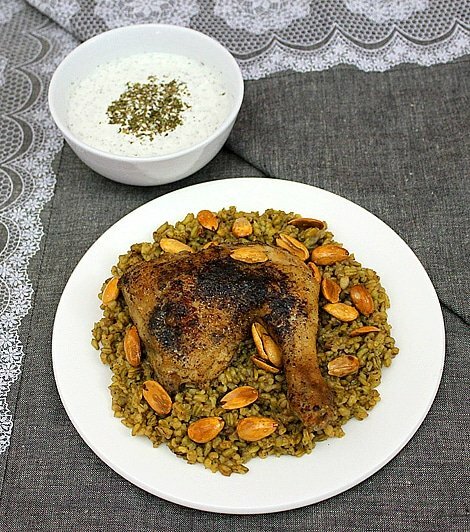 Your chicken and freekeh looks so good together! Now I need to get hold of this freekeh…It sure looks really delicious specially with the chicken and all the herbs and spices. I love a unique and exotic dish such as this one. I love to try sometime. Thanks for sharing. Thanks for your kind words and invitation, I appreciate it. I’ve been to your website and I will for sure submit my photos. very very delicious . I am salivating here..
Muna, this looks absolutely amazing! I love how the chicken turned out, but I never heard about freekeh. I will have to search and see is there any other names in translation. Thank you for sharing and have a wonderful weekend! Looks delicious and I bet it was! 🙂 My mother loves to stuff a whole chicken with freekeh. @Medeja, You are right, I love Arabic food! A fabulous dish! It looks ever so tasty and ddroolworthy. I would mind eating that every week if you ask me! That looks “freekeh”-shly good! Haha! Really, it does look absolutely delicious, I love the combination of spices used in the rub for the chicken, and am new to this new grain but can imagine its nutty flavours workign really well. Thanks for introducing this new dish to us! 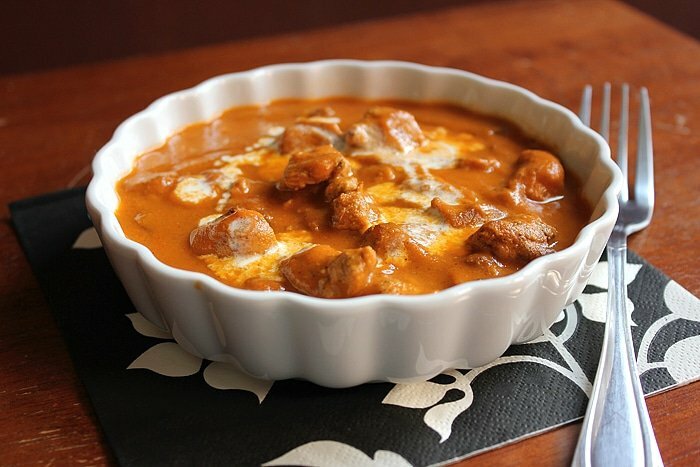 @Rosa, Thanks for stopping by dear :)… This dish is full of flavor and is addictive. Give it a try! @Shu Han, Glad to see you here 🙂 … I guess Freekeh is not a familiar dish, but believe me it’s delicious and you would want to make it again and again! I love cooking kamut and other strains of wheat. So I’m sure I would like this. wow, i tried this last night and taste really delicious. thanks for sharing, now i can cook this anytime.